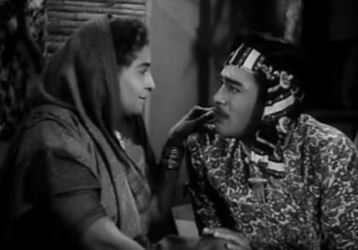 To start at the beginning, though: with Baadal (Sanjeev Kumar), a suave [not to mention obviously well-educated, and adept at swordplay, boxing, etc] villager who is busy flirting—in verse—with the village girls when he hears a screech and sees his mother keel over, having been bashed by a passing chariot. While the girls rush to Mommy’s side, Baadal rushes off in pursuit of the chariot, which he soon discovers is being driven by a hoity-toity noblewoman. Meenal (c) is no Madame de Winter, and Baadal, having overpowered her and flung some insults in return for her own, hauls her back to apologize to Mommy, who has by now risen shakily to her feet. 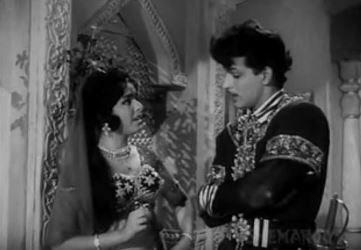 Meenal complies, though grumpily [she should be better-behaved; knowing Hindi cinema, a haughty female who comes up against the hero in the first scene will end up married to him. This old lady is billed to be saasu maa]. Meenal gone her way, Mommy springs a surprise on Baadal: she hands him a taaveez [which, as a device to bring together separated souls and act as proof of identity, is swiftly forgotten by everybody, including the scriptwriter]. She instructs him to go to the palace and present himself to the Maharaja, showing him the taaveez. Baadal is puzzled: why? Does she hope he’ll get employment at the palace? He doesn’t want it. … and, bumping into a stranger named Kamal (Kamal Mehra) on his way out, annoys Kamal, gets challenged to another duel, and settles to meet Kamal at 5 minutes past 7. [This is the point where I began to get really excited. This was Les Trois Mousqetaires, all right]. Baadal now heads for the palace, where, as is to be expected, he is told off. Who does he think he is, barging in like this, demanding to meet the Maharaja? Baadal, not to be outdone, surreptitiously shins up a creeper and into the palace. He blunders into the chambers of—who else but Meenal! Meenal, as we know from a very brief scene previously, is the sister of the Senapati, the Commander in Chief. Her brother has been supporting Mahamantri Uday Singh, the Prime Minister, in the hope that when the Maharaja (who is ailing) cops it, the Mahamantri will become Maharaja and reward the Senapati accordingly. Anyway, Meenal and Baadal have a bit of a good-natured spat, she spitting and he being good-natured about it all. When the soldiers—who’ve noticed Baadal entering the palace—arrive looking for him, Meenal [showing she isn’t immune to Baadal’s charms] sends them on a wild goose chase while Baadal makes his getaway. Baadal, making his way down to the ground, happens to now get a ringside view of a momentous event: through a window, he sees the Mahamantri (Hiralal) suffocating the Maharaja with a pillow. 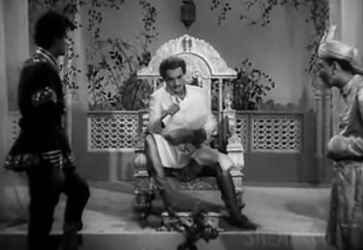 Baadal, open-mouthed, watches as Maharaja Sahib flails about and then gives up the ghost, leaving the Mahamantri looking very satisfied with himself. Dusting himself off, Baadal goes off to keep his date with both Sheru and Kamal. He impresses them both, especially when they realize that he’s got the guts to take both of them on. While they’re fighting, the palace guards arrive (they’ve followed Baadal from the palace) and try to arrest Baadal. Sheru and Kamal immediately spring to Baadal’s aid to send the palace guards scurrying. That done, their friendship is sealed. All for one, one for all, they announce, even though they’re one short of Dumas’s four. They make up for it soon after, by departing completely from Dumas’s story. Baadal, having told Sheru and Kamal about witnessing the murder of the Maharaja, explains why he didn’t denounce the Mahamantri: who would have believed him? The Mahamantri is a powerful and tyrannical man; he would have had Baadal clapped in irons before Baadal could do anything much. … by writing and reciting revolutionary poetry. [Baadal, remember, is a poet]. Calling himself Aazaad Shaayar, and donning a series of disguises, from toothless old Muslim gentleman to jogi to woman, Baadal goes about encouraging rebellion. His poems make it to the Mahamantri, who is thoroughly incensed. They also make their way to Meenal, who [showing an incredible recognition of poetic style I’d not expected of her] puts two and two together and realizes that Baadal is Aazaad Shaayar. She goes to her brother and the Mahamantri, and tells them that she has found a way to lure Aazaad Shaayar to the palace; they should leave it to her. Why she is doing this is anybody’s guess. Perhaps, despite all that simpering, she still harbours a grudge against Baadal for having made her look a fool [or a bad driver, whatever’s worse] in front of his mother. Perhaps she realizes that Baadal is one smart cookie and will come out of this looking really good, and she wants to show him off to the baddies. 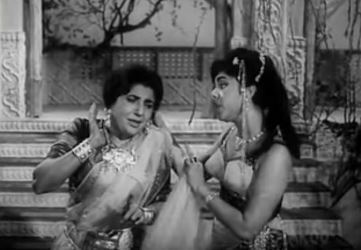 Whatever, Meenal sends off her maid, Bindiya (Shammi) to summon Baadal. Baadal, more than happy to be invited to a tryst with Meenal, agrees. Going into what is, for all purposes, the lion’s den, is however cause for concern—so Baadal [who seems to adore disguises] sneaks into the palace dressed as an old man, whacking great moustache and all. The first time a palace servant passes by with a muttered greeting, Baadal mutters right back at him, making the man look up. This results in a surprising reaction: the man goes all bug-eyed and shrieks “Bhoot!” before racing off. Some pottering about, and a puzzled Baadal comes up against a painting of the late Maharaja [whose face Baadal hadn’t been able to see while the dear departed was being smothered by Mahamantriji]. And, to Baadal’s surprise: it’s Baadal’s own face. How very odd, thinks Baadal, before going off to meet Meenal. [Seriously, has this man never read any books? I can imagine that this period—vague though it may be as to a specific point in time—is before cinema, but surely some sort of proto-Amar Chitra Katha literature must exist? Surely he cannot have missed the fact that he looks exactly like the late Maharaja, to whom his mother had sent him with a taaveez… at the very least, this indicates some hanky-panky regarding Baadal’s parentage, but it doesn’t seem to occur to him]. Baadal now goes off to meet Meenal. She tries to spring a trap, calling in guards to arrest Baadal. 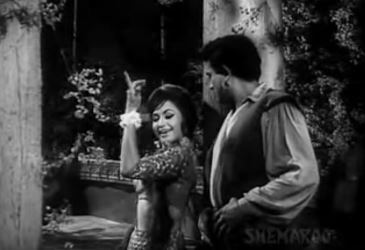 Baadal, not to be outdone, plays a trick on her with the help of Sheru and Kamal, and manages to convince her that he has more men at his command than she does. Meenal, therefore, backs off, and follows it up by singing a song of acquiescence. [The scriptwriter’s looking for ways to insert a song, as well as to provide some comic relief, no matter if the connect between them is utterly inane]. Things are only now beginning to get exciting. Because Baadal tries every now and then to incite more people against the Mahamantri; Meenal cannot seem to make up her mind whether she is on Baadal’s side or not, and there’s Bijuriya too, who has made the unfortunate mistake of thinking a poet’s heart is really in his words. The music. 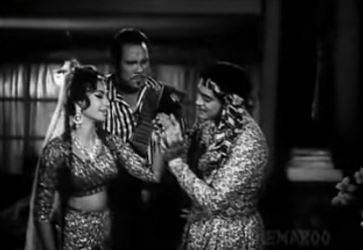 Usha Khanna, often overlooked, composed some good songs for Baadal, including the oft-repeated Apne liye jeeye toh kya jeeye as well as Aapko jo dekhega, which has an unusual two-songs-in-one effect. For one, the heroine. 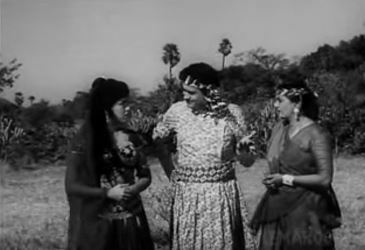 L Vijaylakshmi’s Meenal is not at all my idea of a heroine. Her feistiness consists of being rude and petulant and unpredictable, but when push comes to shove, she whimpers like a dying duck and cannot stand up for herself. Had this role been played by an actress I liked more—Mumtaz, perhaps? —I might have been more kindly disposed. As it was, I just about tolerated her. I would have been much happier to see Baadal teamed up with Bijuriya, though that was obviously impossible, given Baadal’s startling resemblance to the late Maharaja [and you know what that means. An heir to the throne cannot, even in a film supporting the end of tyranny, marry a commoner over a noblewoman]. For another, the script. This started off promisingly enough, but went off the rails midway. Baadal’s rebellion against the Mahamantri seemed perfunctory after the first few attempts, after which he spent most of his time either dressing up in disguises and trying to fool various people, or romancing Meenal. Some plot elements—the taaveez, Bijuriya—went missing in the course of events, never to be spoken of later, and there was too much confusion towards the second half regarding motives and means. Still, all said and done, not a terrible film. A little incoherent, but watchable. I hadn’t heard of this film ever. I’d maybe heard a song or two from this but it never registered. Your comments were hilarious. My vote for the best line goes to: They make up for it soon after, by departing completely from Dumas’s story. I wouldn’t have recognised Bhupendra’s voice in aapko jo dekhega. Thank you for the funny review. I loved reading it. 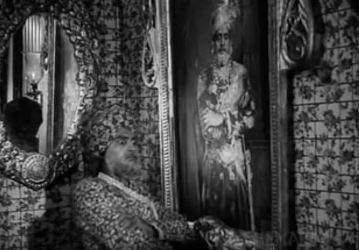 I might have mentioned this before – but there it is again: BAADAL (1966) is one of my favorite early movies of Sanjeev! One is the reasons is easily guessed, I imagine – you covered it so eloquently in your review: Sanjeev looks gorgeous! But before you think me too shallow, I have to add that I equally enjoyed his brilliant and on-the-spot timing, his diction, and his facial expressions throughout the movie! You’re a brilliant writer, my dear, so it shouldn’t surprise me that you so aptly pointed out all the script and continuity flaws – hard not to agree with you; however, for me, that didn’t take away the enjoyment of watching BAADAL (ask me, how many times I’ve seen it; the answer would be – many!). I don’t know much about acting but I was simply mesmerized by the intricacy of Sanjeev’s expressions and movements, even in some of the less significant scenes. Like, for example, when he disguised himself as an old toothless man (to avoid being captured by guards as Azad): watching him cling to his cane and speak in shaky voice, is there any doubt he’s an elderly gentleman and not a handsome barely-thirty hunk? Or the funny scene in a temple when Baadal, as Kusumbi, is flirting with one of the guards who is completely confident he’s talking to a pretty girl? Sheer brilliance, I tell you. About L. Vijayalkshmi. You know, she did three movies with Sanjeev – and I increasingly liked her with each next film. I did not care for her in ALI BABA (1966), warmed up to her in HUSN AUR ISHQ (1966) but really liked her in BAADAL. One of my favorite scenes of their is when she’s having tantrums (what woman wouldn’t seeing your beloved gazing tenderly into some other girl’s eyes?! ), and Baadal, dressed as a sage, shows up in the palace and promises to cure her. The song is funny – but their whispered dialog is very intimate and personal. I really bought their chemistry here. The other reason I like this movie is the camaraderie between Sheru, Kamal, and Baadal (oh, and THE THREE MUSKETEERS was my all-time favorite book growing up; I memorized chapters of it by heart! Russian version had many great songs and handsome actors in all parts – it’s an absolute phenomenon and one of the most beloved films of all times in Russia). Like you, I immediately recognized the lines and the scenes from Duma’s great novel – so exciting! And while the story, indeed, departed from the novel (and, sometimes, from common sense), the friendship between three men is never questioned. They go to such lengths for each other, it’s really impressive and touching. Sheikh Mukhtar made several films in late 60s with Sanjeev; I know a little bit about him – but I was really curious to find out more about Kamal Mehra but, alas, didn’t succeeded. I thought him very funny and talented. And then, of course, there are beautiful songs! Love them all, really! My dear, you must forgive me for such long reply – understandably, I got very excited at the opportunity to discuss Sanjeev’s film :) Thank you again for your wonderful review (I posted it on the fan page) – now, off to watching BAADAL, again! Ha-ha, just kidding. No, I am not. I have to watch! But when?! Oh, Madhu, this sounds extremely delightful! And right up my street, and if I like roly-poly Sanjeev in Angoor and Namkeen and several other films, how much more will I like him here? Yes, to wishing Helen was the heroine. Or Mumtaz. 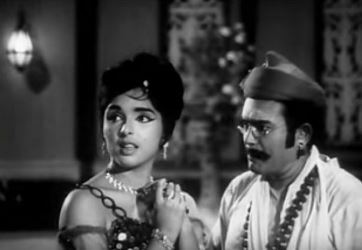 Vijayanirmala looks pretty enough but she was quite vapid. Have to watch, have to watch, have to watch! Well,when I saw the movie being reviewed, I thought that it was Premanth sahab’s Badal, which I have been dying to see for ages. But this movie also seems interesting esp as I have never seen Sanjeev in a swashbuckling role. Also the connection with Three Musketeers (however much they depart from it later) makes it a kind of must-watch. Never heard of this heroine but I quite like Sheikh Mukhtiyar and Helen. And I absolutely,absolutely loved your review. The comments in parentheses are priceless. 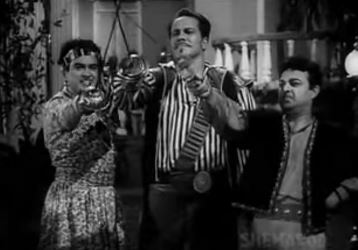 I watched Premnath’s Baadal ages ago – it was shown on Doordarshan when I was a kid. I’ve forgotten almost everything about it, except that that too had a rebel who falls in love with a princess (played by Madhubala). And it had good songs. 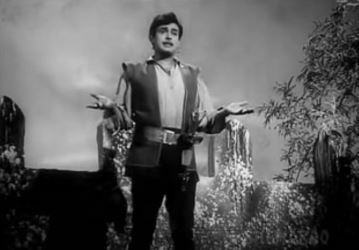 Sanjeev Kumar did do several swashbuckling movies in his early days. I must admit I’ve only seen one other (Raja aur Runk), but I have others on my watchlist that I intend to see sooner rather than later. So glad you liked the review. :-) I will check out your blog post, too. I hear you about wanting to watch a movie for a song. My ultimate of this genre is “Teri duniya se door, chale hoke majboor” from the costume drama Zabak, starring an overweight Shyama with the ultimate ham Mahipal. Hehe. :D I have always wondered whether I should watch that film or not – but the sight of that song always puts me off. Talking of frightful films with good songs, Parasmani takes some beating. You had me chuckling throughout your delightful review, Madhu. My reaction to “Baadal” was the same as yours – not exactly Oscar-worthy but a pretty enjoyable watch nevertheless. I think it speaks well of Sanjeev Kumar that he threw himself into a “non-serious” role with such gusto. 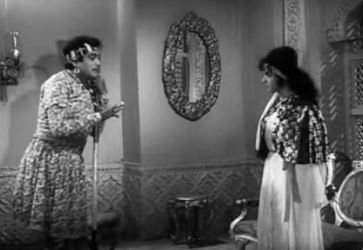 I was going to recommend another, similar Sanjeev Kumar film “Husn aur Ishq” for you, but I think it might be *too* similar – it has L. Vijayalakshmi again. 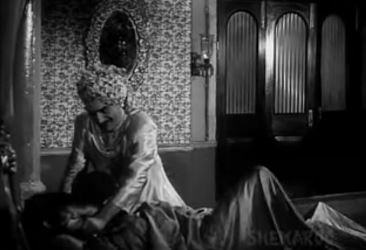 Husn aur Ishq had been on my agenda, but as soon as the credits began to roll, that bit about it being an adaptation of Laila-Majnun came up and I thought, “Yikes! That was a tragedy!” – and left it. Local Sanjeev Kumar expert Alisa assured me, however, that that isn’t the case, so I will give it another try, just for Sanjeev Kumar, sometime. Hopefully sooner rather than later.